Ok so we're on to Week 2 of the #BOBBlogChallenge started by the amazing Sam over at All The Buzz. This week focuses on Hair Heroes. So when it comes to hair maintenance I wash my hair with shampoo and then condition (the ends) with whatever brand I have on the go. So far I have yet to be tied down to any particular brand. It's moreso the after shower maintenance where I've made some long term commitments! 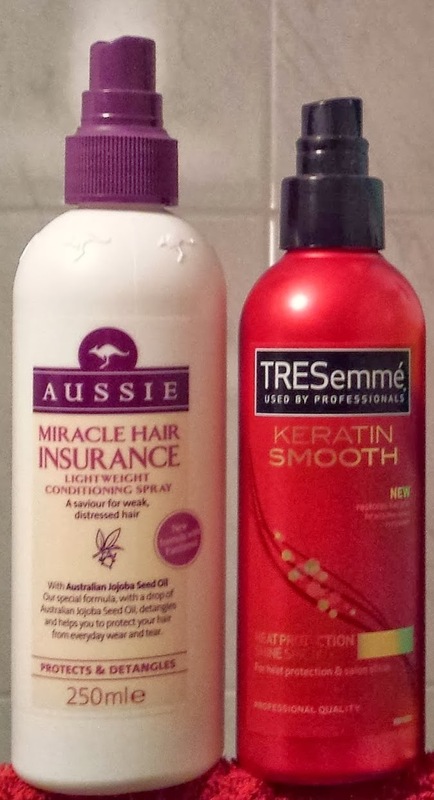 Once I've towel dried my hair, I spray it with Aussie Miracle Hair Insurance Leave-In Conditioner and comb it through. It's perfect as a de-tangler and helps to give my highlighted hair some shine. Not to mention it smells fabulous! Next I use TRESemmé Heat Protector. I find it works well for me and leaves a nice finish on my hair. What I particularly like is the spray you get from the product. I have found a lot of other brands, the spray fire out the spray in a concentrated line, thus giving you spots with loads of product and other areas with none. The fine mist with this product is perfect. When it comes to combing these products through my hair, I couldn't be without my Tangle Teezer. While I feel more like I'm combing a horse's mane than a head of hair (due to the lack of a handle), I cannot argue with the results. I absolutely love this comb. I don't know how I did without one before, as I only have it less than a year, but I certainly won't go back. The version I have here is the travel one, so it's perfect for taking with you on the go, as the little cover stops the bristles from being bent or damaged. I would recommend this to everyone, I find it much less stressful on my hair than a wide tooth comb. It is also amazing for detangling my hair, which used to be quite the nightmare as I have highlights. So while some of the other products I use change week in, week out, these three are consistently part of my hair care routine! And I don't see that changing for some time. So what are you hair care heroes that you cannot be without? Another Tangle Teezer....so I haven't got one of these yet but it's looking like I might need to invest!! I would definitely recommend it. Think the travel one is €2 more expensive, but since I'm always coming and going, worth the investment I reckon! I use the tresemme heat protector too and find it great! I also have the tangle teezer on my list! I loved the Aussie 3 minute miracle mask, but I haven't tried any of their sprays... Its on the list! You won't regret it, I promise! I love the mini tangle teezer that has the little lid! Ideal for the handbag! Yeah it's fab, I keep converting my friends to it, I should be getting commission! Definitely gotta love the tangle teazer! I can't believe I forgot to put it into my post! Silly me :P Love your post though, the Aussie leave in conditioner is a life saver! Ah great minds think alike! Was some very clever marketing going on in Aussie. I don't know anyone who isn't IN LOVE with the smell of Aussie products! I definitely recommend it, I have blonde highlights and it has been a life saver as a de-tangler. I love the smell of Aussie products! I know, they're great aren't they? Remind me of summer and childhood, I'm not sure why, but they do! It's probably the single best hair care investment I've ever made too! Might try the tre semme, I need a good heat protector spray! It's brilliant, I love the shine it leaves on my hair afterwards. The mist-like spray definitely sold it for me though!